When cows are comfortable, they're more productive. Translation? Higher efficiency and profits. Cow comfort in relation to lameness as well as poor facility management and design can be a major issue in the dairy industry. In fact, there is a direct relationship between overall cow comfort and the productive performance of dairy cows. 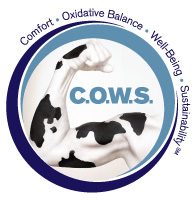 Our goal is to help increase cow comfort so that dairy operations can see increased profits and returns.Lying time, hock and knee health and facility design are factors that can directly affect the comfort and productivity of your herd. Lying time is exactly what it sounds like - the amount of time a cow spends resting comfortably. The C.O.W.S. program measures this data with electronic data loggers. It's important data because if cows aren’t resting enough between milkings they can become less productive. Stocking Density: Overstocking the lying stalls reduces stall availability, increases competition for stalls and decreases lying time. Stall Partitions: Cows prefer wide stalls; lying time improves with stalls wider than 48 inches. Brisket Board:Lying times increase in stalls without brisket boards. Stall Maintenance: Cows prefer to lie on dry bedding. Deep bedded stalls reduce the risk of lameness compared to stalls with mattresses. These results provide science-based recommendations for the design and management of free stalls.Stalls that are wider, well-maintained, less restrictive and are not overstocked increase the time cows spend using the stall for lying or standing and reduce hock lesions and lameness. The surface we provide for cows is one of the most important factors in designing a suitable lying area.Cows prefer softer lying surfaces with ample bedding. Well-bedded stalls increase lying time, prevent hock injuries, and reduce the risk of lameness.Too often poor design leads to preventable health problems. Bedding levels in deep-bedded stalls decrease over days, and lying time declines as the stall empties. Every inch decline decreased lying time by about half an hour per day. Lesions on the point of the hock are common in deep-bedded stalls, likely due to contact with the concrete curb when stalls are not well maintained. Cows spend about half of their time lying down, so it stands to reason that we can keep more cows in a pen than there are lying stalls, right? Wrong. Lying time is highly synchronized, meaning that cows like to lie down at similar times of the day. The result is more competition for stalls and reduced lying time when cows are overstocked. According to popular thinking, when cows are not in the parlor they should be eating or lying down.Even when cows have access to well-designed stalls they spend only about half of their time lying down.We need to take this into account in designing suitable housing. The majority of cows in free stall housing now spend most of their time standing or walking on concrete floors, and the use of concrete floors has been identified as a risk factor for increased claw lesions and lameness due to poor drainage.This may explain why lameness and claw lesions are more common in free stall systems, especially when cows have no access to the outdoors. Cows prefer to stand on softer surfaces, especially when they are lame. The use of well-designed rubber flooring can reduce the risk of lameness. Cows will benefit most from comfortable flooring in those areas where they spend the most time standing, such as in the holding area for the milking parlor. The physical design of the feeding area can also influence feeding behavior. Feed barriers that provide separation between animals, such as headlocks, reduce competition among cows. One proven approach is the use of feeding stalls. Feed stalls prevent competition, and can include soft, dry standing surfaces benefiting cow comfort and hoof health. Cows are motivated to feed by the delivery of fresh TMR and also by the return from milking.Providing fresh feed more frequently can reduce competition for feed and feed sorting. Determining if your cows have healthy hocks. Hock health is an important indicator of the abrasiveness of stall bedding. Injury to the hock is typically a result of prolonged exposure to an abrasive stall surface. When the skin is broken, the opportunity for infection increases. This can lead to swelling, discomfort and lameness. Summary? Unhappy, less productive cows. Healthy knees for a healthier cow. When cows fold their legs to lay down, they can get knee lesions if the stalls aren’t properly bedded. These lesions can lead to swelling, discomfort and lameness. Facilities can be designed with herd health and comfort in mind. A huge part of cow comfort is based on the environment they are in. They need well-designed free stalls with enough room to comfortably lay down and stand. They like soft and dry surfaces. In fact, throughC.O.W.S. initial research, we've found that well-maintained, deep-bedded stalls work the best.And, the more restrictive the stalls are, the greater the risk for lameness.